Students are invited to bring in picture books from their younger years, either from home or borrowed from the library. Each student expresses what they remember feeling about the book and what they find most memorable/interesting/enjoyable about it. Students fold a large page (approx. A2) in half or join two A3 pages together; alternatively, the front and back of an A3 page could be used. Students are to depict a “perfect” world on one side/half while the other side/half will depict an oppressive world (definitions of oppressive should be examined). These depictions can include words, colours or images that relate to urban places, technology, people, relationships, values, nature, activities or food. These categories can be named during initial discussions about what students have included in the displays. Once identified, the categories can be used to stimulate more ideas for students. Display these or store them until the focus of study is on the social and physical setting of The Lost Thing, which will involve a discussion of utopias and dystopias. One of the central themes teachers can explore is belonging. To get students thinking about different aspects of belonging, a mind map can be crafted. This can either be done on paper or, for those teachers wishing to employ digital learning tools, an online mind-mapping application like Bubbl.us or Popplet. feelings: when they feel part of a group and when they feel excluded from a group. Following the first reading of The Lost Thing, students are given time to reflect on their initial response using the Think, Puzzle, Explore activity. The responses to this activity can then be used as a reference point for the conclusion of the unit, enabling students to reflect upon how their understanding of The Lost Thing has evolved. Some teachers will recognise this process will be similar to the KWL activity (What I know, What I want to know, What I learned), which is focused on fact accumulation and knowledge. In contrast, this Think, Puzzle, Explore activity promotes more open-ended, inquiry-style responses that invite speculation and tentative interpretations. Butcher’s paper or space on walls to assemble responses under the headings: Think, Puzzle and Explore. Post-it notes (teachers wishing to employ digital learning tools will find Padlet a useful “virtual” board to assemble class responses). After reading the book together and giving students further time to read it for themselves and perhaps discuss their reactions with peers, distribute about six post-it notes per student. Take each of these questions in turn and allow time for students to write their responses on the post-it notes. What do you think you know about The Lost Thing (the book, not necessarily the character)? What questions or puzzles do you have about the book? How might you explore the puzzles you have about this book? As students respond to each of these questions they can attach their post-it notes under the appropriate heading. Each of their contributions should be initialed for later use and to help facilitate discussion. The initial contributions can serve as stimulus for an early discussion with the teacher choosing some interesting responses and asking students to expand on their thoughts. At the end of the unit, these responses can be revisited with a reflective activity, outlined in the Informed reaction section of this unit. A significant feature of Shaun Tan’s writing is the simplicity of the written text. Taken alone, the written text provides little detail about the narrative. The lost thing itself, for instance, could be read as a puppy-like creature if only the words were considered. From the narrow perspective of the written text, then, the narrative is presented in the form of an anecdote which Tan appears to offer directly to the reader: “So you want to hear a story?”. Despite the apparently bizarre nature of his encounter with a strange creature, Shaun (the human protagonist) adopts a dry, matter-of-fact tone, which is in keeping with the colourless place in which he lives. The anecdote itself is bookended by Tan traveling on a tram, a framing device that provides the impression that the anecdote is told within a single tram journey. Students can identify conventional aspects of narrative structure and plot within the basic detail offered by the written text. The elements of exposition, climax and resolution are quite clear, but students may need support in identifying important conflicts. While there are minor conflicts with other characters in the story, most obviously with Shaun’s parents, it is the conflict with society that is central to several themes. The nature of this society is elaborated upon in the Setting section below, but the contrast between it and the lost thing’s eventual sanctuary is striking. The gentle and neutral tone taken by the narrative voice, and the fact that Shaun quietly and unquestioningly takes his solitary place back in the society (resolution/denouement) may obscure for some younger readers the rather bleak future he faces. Draw a line on a whiteboard (whole class activity), or place a string across some desks (small group activity) – this represents the tug-of-war rope. In the middle of the rope write the statement, “The Lost Thing has a happy ending” and the words “Yes” and “No” at each end of the rope. Provide students with post-it notes to generate as many “tugs” on the rope as possible (evidence to support statement on the “yes” side, evidence to reject statement on the “no” side. After a few “tugs” (post-it notes) have been placed, students are to evaluate the relative strengths of the tugs, whereby the stronger points are placed closer at the farther ends of the rope. Concentrate on any “what if” or “it depends” kinds of statements during the placement of tugs and add these above the rope for later exploration. If done in small groups, each group reports back its verdict about whether the story had a happy ending and to explain the thinking and discussion involved. The central human character in The Lost Thing is not named in the story itself, but the postcard-style blurb on the back cover identifies the narrator as Shaun. Even though Shaun Tan himself acknowledges that this character is modeled to some extent on himself, it would unnecessarily complicate the reading of the book at a Year 7 or 8 level to bring in questions of auto-biographical relevance. It would be sufficient to concentrate on Shaun’s (the character’s) ordinariness and conventionality that befits the uniformity and conformity of the society in which he lives. This character is illustrated in a way to produce puzzlement and curiosity. It is an odd combination of mechanical and organic parts, something it shares with other “things” in the book. Tan has written that he got the idea for The Lost Thing after making a sketch of a crab while at the beach. While the lost thing doesn’t speak in this story, the impression is created that – despite its size – it is gentle and vulnerable. Activity: After looking at the physical qualities of the lost thing and other “things” in the utopia scene, student can draw or construct their own “thing”; these creations can then be hung around the classroom to create a menagerie of “things”. Shaun’s artistic friend, Pete, serves as a contrast to the conformity of other characters and human figures in the book. The swirly, colourful lines depicted in his artwork suggest he sees the world differently and is willing to look at it from different perspectives; a point emphasised by him sitting on the roof of a house and looking over the neighbourhood and Shaun noting he has an opinion about everything. His dialogue also reveals he is willing to suggest alternative ways of seeing issues and is comfortable with uncertainty: “Maybe it doesn’t belong to anyone. Maybe it doesn’t come from anywhere.” It is interesting to note that while Pete is more “colourful” than others in Tan’s world, with his bright yellow shirt and his wavy hair, he is still constrained by the society he lives in, as can be noted by the plumbing images on his shirt and the fact that, according to the postcard on the back cover, he studies Applied Industrial Algebra. The centrality of the images to any reading of The Lost Thing is highly relevant in relation to the setting, both physical and social. Apart from the reference to the windowless “tall, grey building” that houses the “Department of Odds and Ends” very little is revealed about the grim physical and social setting depicted in the images. This makes a study of The Lost Thing an ideal opportunity to clarify the distinction between the physical and social settings of a narrative. There are many “clues” in the images which indicate the kind of society in which the story is set: what it values (e.g. precision, growth, conformity, rules/order) and doesn’t value (e.g. the natural world, art, freedom, individuality); the sanctuary of “things”, where the curvy arrows leads, can be juxtaposed to the other images of urban life depicted in the book in order to reveal a binary of places. In the sanctuary image, the word “utopia” is written on a wall almost in the centre of the image. This allows readers, by extension, to consider the rest of the urban physical and social setting as an example of dystopia. One of the introductory activities, in which students listed the attributes of perfect and oppressive places to live, can now be recalled in relation to The Lost Thing. This activity is intended for students to look closely at the images and simply observe before attempting any interpretations. It is suggested the process is modeled with a shared image and then be done individually with subsequent sharing done in groups. Allow students time to examine one page silently on their own for two to three minutes (the page which begins, “This all happened a few summers ago…” is suggested – including the page backing the montage of mathematical/engineering cut-outs). If possible, project a scan of the page onto a screen and invite students to share what they can see. It should be emphasised that interpretations are not expected at this stage. A guiding point can be that they should be able to put their finger on any observation. These observations can be listed on the board. Ask students what they think the image reveals about the physical world represented in the image. List these responses under the heading “Physical setting”. Ask students what they think can be revealed about the society in which the action takes place. Guiding questions can be useful here, for instance: what might people find important or unimportant in this society? What is missing from this world (according to this image)? Would you like to go on a holiday to here? Why not? Responses should be recorded under the heading “Social setting”. Ask students if what they have seen and thought has triggered any puzzling questions. Can they finish this sentence: “I wonder why/whether/if/who…”. As a guide, these questions should move beyond the page under scrutiny and begin to open up to broader themes and ideas triggered by the image. Students may select their own page from The Lost Thing and complete the above sequence on their own. Then, in groups of three to four, students share their interpretations of the physical and social settings, supported by textual evidence they have “seen”. As a group, the students select three or four “wonders” to share with the class. The Lost Thing is most commonly considered a picture book, a form which connotes an audience of young children. An argument might be made however, that The Lost Thing works as a graphic short story, in the same way a graphic novel suggests complexity of ideas that elevates it beyond a comic book. The richness of detail, depth of ideas and cultural references and allusions enable adults to gain much from it, while the simplicity of narrative and quirky humour appeals to younger readers. Engaging in a discussion with students about audience and picture book expectations will be a fruitful way to foreground concepts of audience and form. Shaun Tan has written in some detail on this subject in an essay called, “Picture Books: Who are they for?”, in which he offers a number of interesting insights highly relevant to a study of The Lost Thing. Representations of belonging: Using the picture books of Shaun Tan. A chart outlining essential aspects of visual grammar, divided into the categories of representational, interactional and compositional meanings. ‘Viewing The Viewer‘: postmodern picture books for teaching and learning in secondary English education. The set of resources available here are based on Shaun Tan’s collaboration with Gary Crew in The Viewer. The “Scaffold for Reading Visual Images” can be easily adapted and used for The Lost Thing. NSW Government – Ways of Viewing and Teaching Picture Books. This offers a concise and extensive glossary of visual literacy concepts. Beyond the visual literacy required to understand and interpret individual images, The Lost Thing requires readers to comprehend the types of transitions suggested between panels. A good example of this occurs on the double-page spread early in the book which contains the text, “I asked a few people if they knew anything about it…”. The three large panels on the right resemble a triptych representing the same physical location – as is indicated by the continuation of pipework across panels. By splitting the scene into three segments, Tan is able to locate Shaun and the lost thing in each panel, thereby indicating the passage of time. The sense of time passing is also reflected by the gradual dissipation of the cloud formation in the square panels above the triptych. Non sequitur: a set of panels seemingly unrelated in relation to images or words (there is no example of this in The Lost Thing). McLoud. S., 1993. Refer to pages 237 to 240 of Springboard English Textual Power, which provides an extract from Scott McCloud’s Making Comics that includes illustrated examples of the transitions and the functions each has. Students can read these descriptions and then find examples of panel sequences for each type of transition. The Lost Thing is rich in opportunities to develop students’ understanding of symbolism, which will also help with generating their own interpretations of the individual images and the whole text. The symbols can be discussed in terms of different categories. Colours: notably, the juxtaposition between the grey bleakness of Shaun’s world and the utopian sanctuary can emphasise certain qualities of each place. Panel layout: an interesting case is the sideways layout of the utopian scene. The reader’s action to turn the book sideways can be read as symbolising the importance of looking at things differently. Objects in the text: there are so many symbolic objects, but interesting examples can include the metal flower in Shaun’s living room, the clusters of rules and signs, and the pile of pages required to be filled in at the Department of Odds and Ends. Written text in images: sometimes these are written on walls, like “MORE” in the beach wide view, or fragments of cutouts pasted into the images and which link with the background montage on almost all pages. Actions: when we see the city crowds walking in the same direction in the page after the newspaper advertisement, or Pete conversing on the roof, these actions can symbolise larger ideas such as those relating to conformity, different perspectives, monotony and so on. Using these categories, students can identify other elements in the book that could symbolise something greater than the thing itself. index cards, cut in half (five card halves for each student). The double-page scans are pinned around the classroom, akin to an exhibition. Students are informed that each post-it colour corresponds to a different aspect of The Lost Thing‘s construction. (An analysis key (PDF, 96KB) has been provided. Insert particular post-it note colours in the first column and making the chart visible to the class). Students are instructed to identify five features in any of the double-page scans that correspond to an element of construction and stick the post-it, with their initials on it, near the textual feature. Importantly, each student can only use each post-it colour once. The colour coding of the elements of construction will produce a striking visual indication of the range and regularity of techniques used by Tan. For each of the features identified by students in the previous step, students write (on the index card halves) a brief explanation of how that feature “works” to encourage particular readings related to: character, setting (social or physical), theme, plot. Once written, these should be attached beneath the relevant double-page scan in the “exhibition”. Continuing with the colour coding, these index cards can also have the relevant post-it note colour attached to them, enabling a rapid way to see the same element of construction working to different ends (characterisation, setting, thematic development). Shaun Tan has written and spoken quite extensively about his approach to art, which respects what the reader or viewer brings to a work in order to create meaning. His sparse writing coupled with detailed images that are not prone to easy classification results in texts, whether on one page or book-length, that invite readers/viewers to draw on their own knowledge and experience to create meaning. In this interview, for instance (at 07:30), Tan relates the experience of showing The Lost Thing to friends and getting diametrically opposed responses such as “delightfully whimsical” and “it’s like a living nightmare”. The State Library of Victoria has another useful video for this topic in which Tan answers the question, Do you encourage open interpretation of your work? Indeed, that story’s narrator says directly to the reader, “Don’t ask me what the moral is,” essentially challenging the reader to figure it out for him or herself. The question of making meaning from The Lost Thing is addressed quite extensively by Tan in his essay “Picture books: Who are they for?”. This essay should be considered essential reading for any teacher embarking on teaching this book, as this extract about meaning and interpretation will attest. For the moment, one possible reading of The Lost Thing that I’d like to suggest has to do with the theme of reading itself. It’s actually a very self-reflexive book in that it is about ‘visual literacy’, and the importance of having a critical imagination, and of playing. Teachers can support students as they generate their own interpretations of the text by scaffolding ways of bringing their own understandings and experiences to their readings. Beyond making meaning from individual images, scaffolding a form of pattern recognition can also help create a meaning for the book as a whole. The Development of Themes (PDF, 97KB) retrieval chart offers some themes in the columns to focus on, but can be modified at the teacher’s discretion (a blank column can be left for students willing or able to identify a different theme). The rows beneath each theme are to identify different aspects of the text which are somehow connected or related to the theme. The point here is to assemble the different aspects of the text which can be read as contributing to the theme in some way. By explaining the connection between the textual elements and the theme, students should be encouraged to make statements about the theme. In an interview with the ABC’s Lingua Franca program, Tan uses the metaphor of a battery to imagine the meaning-making dynamic between text and reader. When working I often like to think of words and images as opposite points on a battery, creating a potential voltage through a ‘gap’ between telling and showing. It requires the reader’s imagination to complete the circuit, their thoughts and feelings being the current that fills the silent space, without prescription. What will become evident from the retrieval chart exercise is that a range of textual elements combine to develop a theme, so that there is a cohesiveness among the elements that can support certain readings more successfully than others. explain if the element/s suggest any ideas about the theme? describe if the element/s serve any other themes? rank the different elements in terms of their significance to the development of theme – why did you choose the top and bottom elements the way you did? Shaun Tan is a recognised artist as well as illustrator. Tan shares many of his stand-alone artworks in his personal blog, The Bird King, which can be useful to show to students to see recurring ideas, themes and imagery. Tan talks about his wide range of influences in the FAQ section of his website and mentions specifically Jeffery Smart and Edward Hopper. The influence of Jeffery Smart’s 1962 painting, Cahill Expressway, is clearly evident in The Lost Thing‘s cover (and a glimpse of a similar painting is seen on the wall of the Shaun’s family’s living room). Tan similarly references the well-known 1955 painting by John Brack, Collins Street. Exposing students to these these influences presents an opportunity for a stimulating set of comparative exercises with students. Provide students with copies of the document, The Lost Thing: making meaning with other art (PDF, 165KB). Teachers should model the first exercise of Part 1 where students are asked to identify a difference between Tan’s work and the original, and the effect this change has on suggesting an idea or developing a theme. Part 2 of the activity involves students looking up other works by the same artists and getting students to make connections with The Lost Thing. These artworks can be found at the “Artistic influences for Tan’s The Lost Thing“ web page. Other artistic influences mentioned by Tan that relate more to the Utopia scene are those of Hieronymus Bosch and the Spanish Surrealists. A simple Google image search of Spanish Surrealists will provide plentiful images to give students a sense of the colour, vibrancy and the often bizarre subject matter of Surrealism; qualities that can also be seen in the Utopia image. One of the most famous works by Bosch is The Garden of Earthly Delights, a triptych depicting the Garden of Eden and Hell on the left and right panels, and the central panel involving people carousing with each other and animal figures in a strange landscape dotted with odd architecture. The link provided here is of a virtual tour of the expansive painting and it needs to be noted that there is adult content which some teachers may find unsuitable for Year 7/8 students. The Lost Thing has inspired a number of significant works in other creative fields including a live musical performance of the film’s soundtrack and a theatre production. Of course, the most significant adaptation is the animated short film which has won numerous awards around the world, including an Oscar for Best Animated Short (2011). Students will undoubtedly be keen to see this adaptation and is presents an excellent opportunity to examine different aspects of multimodality. The Australian Centre for the Moving Image (ACMI) has produced a comprehensive “From Book to Film” Education Resource that is highly recommended if the film is the focus of a unit of work. When the book is the central focus, the film allows students to consider the affordances offered by the printed version in comparison to the film adaptation. In other words, what does each mode allow (or disallow) in terms of storytelling and reader/viewer interactions? How will the things move on screen? What sounds will they make? What kind of voice will the narrator need? How should the soundtrack sound? The are many interviews and written articles now available online that talk about this production process and several are listed on the additional resources page. The film adaptation stays very true to the book, but there is a significant change to the Pete character who is changed from an “artistic type” to someone driven by the scientific method. A fruitful discussion can be facilitated around possible reasons for the decision to change Pete’s character in this way. Such a discussion could be based in small groups that role-play a production meeting where the change is debated. These pros and cons can then be related to aspects of construction such as thematic cohesion, plotting, and character. 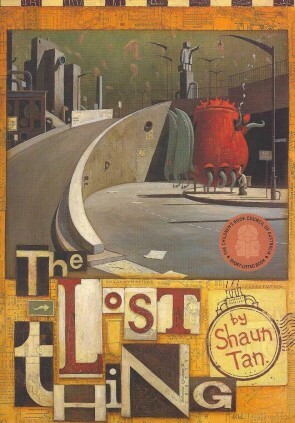 Prior to The Lost Thing Shaun Tan worked successfully as an illustrator/collaborator with other Australian writers such as Gary Crew and John Marsden. The Lost Thing therefore represents a clear turning point in Tan’s career where he can take creative control of text in order to create an individual vision. The success that followed The Lost Thing has allowed Tan to pursue a range of other projects and creative challenges, including murals and a digital app version of The Rules of Summer. The most notable of these is the critically acclaimed and wordless The Arrival which is also featured as a Reading Australia text. The Singing Bones (2015) reveals Tan venturing into sculpture to re-imagine Grimms’ fairy tales. These examples demonstrate that in the years since The Lost Thing was published Tan has been building a diverse body of work that is cementing him as a serious and respected creative innovator in Australia and globally. His non-fiction writing and speaking about his creative work reveal an insightful and generous contributor to the public discourse about art and literature, and where the two intersect. The Lost Thing, while continuing to be referred to as a picture book, has pushed and challenged the boundaries of what constitutes a picture book. Structurally and stylistically, The Lost Thing can be argued to more closely resemble a graphic novel, save for its length. In this sense the book invites a new book category to be considered – the graphic short story – which doesn’t narrow its perceived audience or diminish its ideas. This response to The Lost Thing will be the culmination of previous writing tasks that have given students opportunities to articulate their interpretations and understanding of theme. Panel discussions are ideal vehicles through which students demonstrate understandings and gain experience in engaging in literary discourse. The audience will also benefit from each panel discussion by listening to other interpretations and responses to The Lost Thing. Since the panel discussion requires students to synthesise knowledge and skills gained over previous lessons, extensive preparation time is not required. Even so, at the Year 7/8 level students may gain in confidence by having a practice run within their friendship groups. Divide students into groups of four or five. an image that seemed particularly powerful or meaningful with an explanation of why it was chosen. The time given to each panel discussion should equate to an average speaking time of two minutes per student (that is, 10 minutes for a five-member group). A simple set of prompt cards can be created to stimulate discussion and should be placed face-down near the panel. Should the panel members struggle to keep the discussion flowing, the top card can be selected to shift the discussion to that topic. These cards can read or include: a particular image, themes, ideas, audience, visual style, dystopia/utopia, characterisation, social setting, physical setting. Some guidance should be given about the purposes and conventions of panel discussion; principally, it is not a debate where points are given for diminishing the contributions of others in the eyes of the audience/assessor (as in a debate). Rather, all members are responsible for the success of the discussion by maintaining the flow of ideas and elaborating them. This means coming prepared with questions to ask of each other and willingly responding to other members’ comments, whether to agree, disagree, elaborate, seek clarification, or support with other examples. A Panel Discussion guide (PDF, 159KB) is provided for students to be aware of conventions and expectations. If this is the students’ first attempt at panel discussions, it is advisable to identify and screen examples from the media. Some of these can include: The Footy Show, Q&A, The New Inventors, or Offsiders. Teachers now return students’ attention to the initial Think, Puzzle, Explore activity completed at the start of the unit (outlined in the Initial response tab of this unit). The first two questions can be asked again, allowing students to reflect upon how their thinking and understanding has developed. Some focus can be given to student responses by drawing their attention to character, theme, plot and so on. It can be useful to make these post-it notes a different colour to the earlier activity to clearly differentiate the before and after responses. Again, all responses should be initialed. The third question can be altered to draw attention to the ways students have explored their initial puzzles. How have we explored the puzzles we had about this book? By adding these new responses to the first set, teachers can facilitate a class discussion, set up small discussion groups, or ask for more formally written responses from each student that address their shifts in thinking and understanding. The major creative task will involve students incorporating their understanding of picture book conventions and expanding on one of The Lost Thing’s themes. This unit of work will have drawn attention to the way Shaun Tan took inspiration from various sources when constructing The Lost Thing. In this task students will take inspiration from one or more of The Lost Thing’s elements to construct their own picture book. Students need to make two decisions: one based on theme and one based on an element of construction. Students select a theme The Lost Thing explores that they would like to construct their own picture book around. These may include (but not limited to) conformity, dystopia/utopia, creativity, individuality, bureaucracy, modern life, art, friendship or belonging. Different teachers may have placed varying degrees of emphasis upon these themes during the study so some guidance to students will be appropriate. imagining what happened to the the lost thing before Shaun found him (e.g. how did he get to the beach?). montage (combining any of the above with found other media) . Assessing the intellectual inputs to creative work can be aided by students submitting a short statement about the decisions they made. For this task, it would be helpful for students to explain what they hoped to communicate to the reader about the selected theme. The second aspect to this would be to outline the decisions made in relation to the narrative and visual elements intended to foreground their ideas about the theme. This is a comprehensive resource by ACMI that offers many avenues to consider the book in conjunction with its film adaptation. The set of resources available here is based on Shaun Tan’s collaboration with Gary Crew in The Viewer. The Scaffold for Reading Visual Images can be easily adapted and used for The Lost Thing. This site can be useful for teachers who want to extend their exploration of ‘belonging’ as a theme. Non-Shaun Tan texts are also suggested as part of the focus. Offers a concise and extensive glossary of visual literacy concepts. Although aimed at younger readers, this resource offers many ideas that can be adapted for older students. This is a chapter from an English text book which offers a unit of work based on Shaun Tan’s The Arrival. While the content would suit older students, there are many activities and lessons that can be adapted to a Year 7/8 study of The Lost Thing. This Reading Australia unit has utilised this text’s coverage of panel transitions in the Close study section. Shaun Tan’s website is a rich source of information about his approach to his work and insights about the texts he creates. His essays in the Comments and Notes section are highly recommended for anyone teaching visual texts. More frequently updated than Tan’s website, this blog mainly features new art works by Tan, along with the occasional comment about them. Useful for anyone interested in Tan’s wider body of work. This short profile taken from The Big Issue can serve as a comprehension/literacy exercise. A range of Shaun Tan images are presented here from various books, which can be useful when needing a projection for teaching objectives. For teachers wishing to incorporate newspaper articles as part of literacy development, this short biographical piece from Tan’s home town paper would be suitable. This interview was conducted on the occasion of Tan winning the Academy Award for The Lost Thing. Before, during and after viewing activities are provided by the ABC Splash website. An interview mainly about the production of the film. This interview presents Tan’s detailed responses to questions about the way he thinks about his work and creativity. Great for comprehension activities. This is a lovely, quirky interview in which Tan answers questions with simple illustrations. State Library Victoria – Do you encourage open interpretation of your work? Watching an interview like this will give students confidence to interpret work in their own way because they hear Tan say he actively removes aspects that would otherwise narrow down possible interpretations. Although this essay by Tan is quite lengthy for the intended age group of this program, it offers many ideas about his creative process and thought about visual storytelling that can stimulate discussion and student responses. The quality of this footage is not great. It is highly recommended to purchase a copy since it will be a valuable resource for years to come. There are also useful extra features that can support student learning. Duration Four weeks, assuming four lessons per week (not including time allocated for completing major assessment pieces). MATTEO PANTALONE has been teaching English and Literature since 1999 in a range of educational contexts, including regional and urban, public and independent, and the training of teachers in their tertiary qualifications. A common feature of each role has been his willingness to embrace the teaching and learning opportunities afforded by information and communication technologies, and to share his strategies with teaching colleagues. Matteo has coordinated language and literacy units for the University of Tasmania. Matteo’s blog, Digital Literacies, explores curriculum and pedagogical implications of modern communication technologies.